Home › › Join Us at the Incredible Kasa Moto AFTERWORK on July 11th! 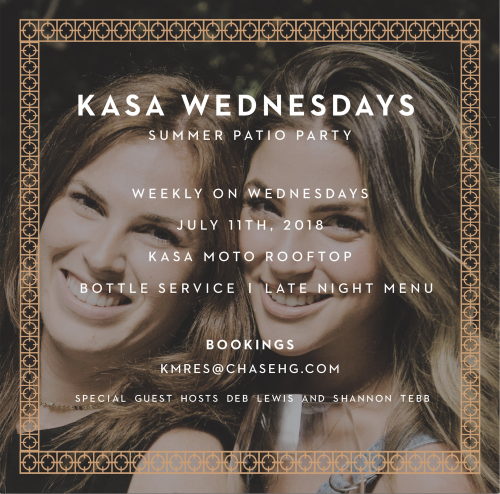 Join Us at the Incredible Kasa Moto AFTERWORK on July 11th! All Events › Join Us at the Incredible Kasa Moto AFTERWORK on July 11th! This after-work patio evening will take place on the roof terrace of Kasa Moto from 6:00 PM to 11:45 PM. You don’t want to miss this incredible opportunity to network while sipping a drink on one of the most beautiful patios on the roof in Toronto. Summer has finally arrived and it’s the right time to enjoy this beautiful roof terrace. Cocktails, good food, good company, and the amazing Yorkville backdrop will ensure you have a wonderful time. Where: Kasa Moto, 115 Yorkville Ave Toronto, ON M4W 1C1.